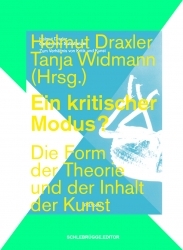 Theory & theme issues » Ein kritischer Modus? The publication in german language gathers three lectures by Helmut Draxler. Initial point of that small series of lectures, held at the University of Fine Arts, Vienna, are issues taken from Draxler’s 2007 released publication Gefährliche Substanzen. Zum Verhältnis von Kritik und Kunst. In this context three exhibitions with young artists have been held that are also represented in the book.The titles of the lectures have been taken over to name the exhibitions. This process, leading from the reading of a publication to exhibitions and the production of another book, is reflected in the talks. It is the construct of a reader that makes comprehensible how theory and practice of art can be related without dissolving in one another – and how in this comparativeness they open up a symbolic space of criticism.